Ok, I’m getting really tired of this project. I’m sooo ready to be done. I’m almost finished the third ball of yarn. I might have to shorten the dress a bit since I only have four balls. I don’t think that’ll be a problem, though, as I was planning on pairing it with tights or leggings. I’m pretty sure Eva will wear this dress before the new baby, and it won’t fit her until at least winter (Yes, it’s that big. ), so she’ll need something on her legs. 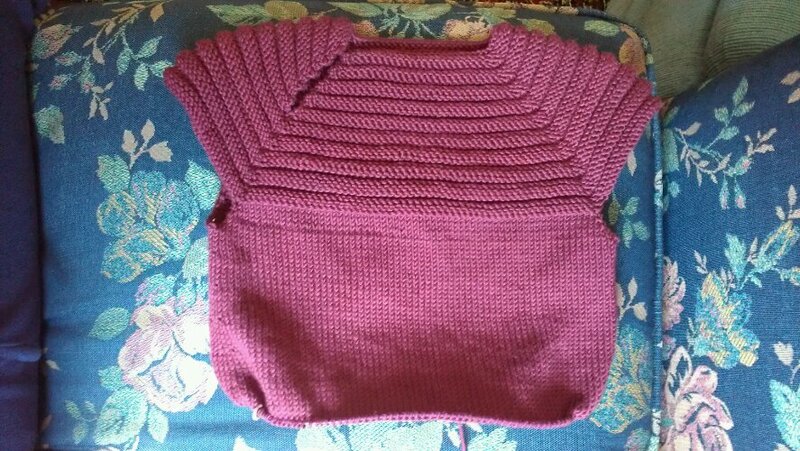 Categories: Knit | Tags: baby, cashmere, cotton, dress, handmade, knit, purple, raglan, red, silk | Permalink.